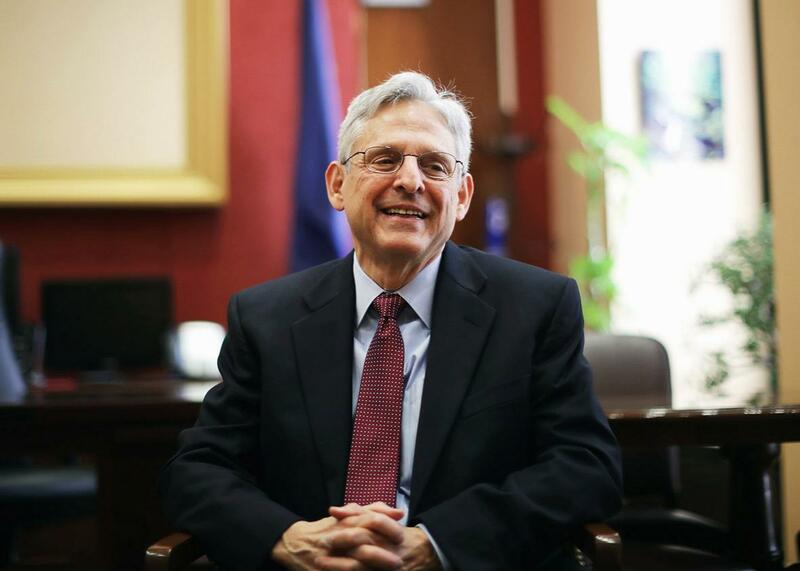 How Senate obstruction of Merrick Garland spoiled this term. Entry 2: Whither the full court. Judge Merrick Garland meets with Sen. Jeff Merkley on Capitol Hill on May 19 in Washington. It’s a great privilege to join all of you. I’m a 15-year fan of this event, as well as of anything Dahlia does, and I am thrilled to be at the table. And a special greeting to Judge Posner, who 30 years ago generously took me and John Hamilton—then my co-clerk with Judge Richard Cudahy, now my husband—to lunch early in our clerkship. We had the fortune to learn much from those two great judges, and foremost now in my mind are lessons greatly needed these days in how to disagree respectfully and constructively. Walter, your post prompts two sets of thoughts. You are certainly right to note the distorting effects of an eight-justice court. Not to get too political, but it feels right to emphasize some relevant presidential and partisan politics that brought us to this point. Senate Republicans’ refusal even to provide Judge Merrick Garland a hearing is an unprecedented shirking of a vital constitutional duty—yet they seem to be getting away with it. From my home in Bloomington, a progressive university community in southern Indiana, I have been surprised by the degree to which a disapproving, often-disgusted, but ultimately resigned public has come to accept Senate dysfunction as inevitable, even at the level of blocking an enormously qualified, noncontroversial Supreme Court nominee. At last weekend’s Indiana Democratic Convention (where I served as a delegate), the numerous speakers rarely mentioned the court vacancy—I cannot imagine the same would be true if the parties were reversed. Speakers often did express outrage at Donald Trump’s attacks on the integrity of our own Hoosier Judge Gonzalo Curiel, an alumnus of my Indiana University Maurer School of Law who we recently honored for his distinguished service. I mention this to remind us that we should not be suffering these effects of a Supreme Court (and lower courts) diminished in numbers. And if we fail to keep the issue front and center, our collective passivity will prolong the harms to the proper functioning of our independent judiciary and thus the American people. A second preliminary thought: As the term’s end approaches, I am thinking about how wrong I was, every step of the way and very publicly, in predicting how the court would rule on the essential issue in Zubik. Like many, I found Zubik’s predecessor, Hobby Lobby, a great disappointment. The court clearly failed to properly appreciate the relative harms inflicted when for-profit corporations assert religious grounds to deny employees their right to health insurance coverage for the contraception that employees choose, based on their own life circumstances, medical needs, and religious beliefs. Walter and I co-authored amicus briefs in both Hobby Lobby and Zubik for the Guttmacher Institute to document the harm of interfering with women’s access to the form of contraception right for them and the enormous value of no-cost contraception to women, families, and society. And here is an important public service announcement from those briefs that I especially like to provide student audiences: Not all contraception is created equal. For example, long-acting reversible contraceptives, such as IUDs, can be 90 times more effective than male condoms in preventing unintended pregnancy in the first year of typical use. So Hobby Lobby was disappointing but not particularly surprising—and tempered by the court’s crafting of what it characterized as a win-win fix: The government could extend an existing accommodation to enable affected employees to obtain no-cost contraception through other means. Judge Posner provided an insightful analogy in ruling against the claim for the 7th U.S. Circuit Court of Appeals: Similar reasoning could support a conscientious objector to military service raising a second objection to the government’s inevitable response of drafting another individual to serve instead. Ultimately, all but one circuit court to consider the question agreed and ruled for the government, and with Justice Antonin Scalia’s death, the outcome seemed to be certain. And that is what I confidently advised my client and fellow board members at last March’s meeting of the Guttmacher board of directors. I think I will avoid the temptation either here or at the next Guttmacher board meeting (which happens to start Thursday) to predict how the court will rule in Whole Women’s Health. We all will know soon enough.